Spent two very enjoyable half days at Westleton. 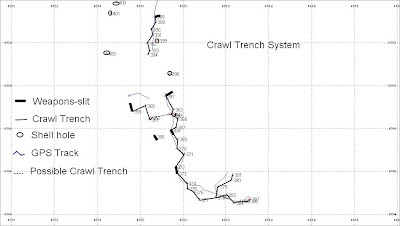 On Sunday, met up with David Sims to record a crawl trench system I have already mapped. However this time we mapped it with the traditional method of tape (using a 50 mtr tape) and offsets. This was a learning exercise for me. Mapping this way produces a more accurate plan than the way I usually map with a GPS. However it is very time consuming - it took two of us 4 hrs to map the system as opposed to just under an hour I sepnt using a GPS sometime last year. (1) by marking changes in direction of the trench with way points then 'joining up the dots'. (2) by recording the trench using a track. Of the two methods I find using way points to be the most accurate. However if way points are too close together odd results can arise so it pays to make a rough sketch as well to help in producing the plan. So any conclusions? Recording by tape and offsets is the most accurate and picks up all the twists and turns in a trench system. 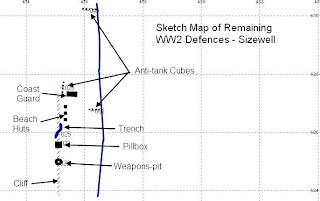 Using a GPS and 'joining up the dots' (way points) can make the trench system appear much more linear than it is in reality. However it's a very fast way of recoding and does provide an accurate enough record for my purpose. The system mapped on Monday would again have been for training purposes, presumably dates from 1943 onwards. 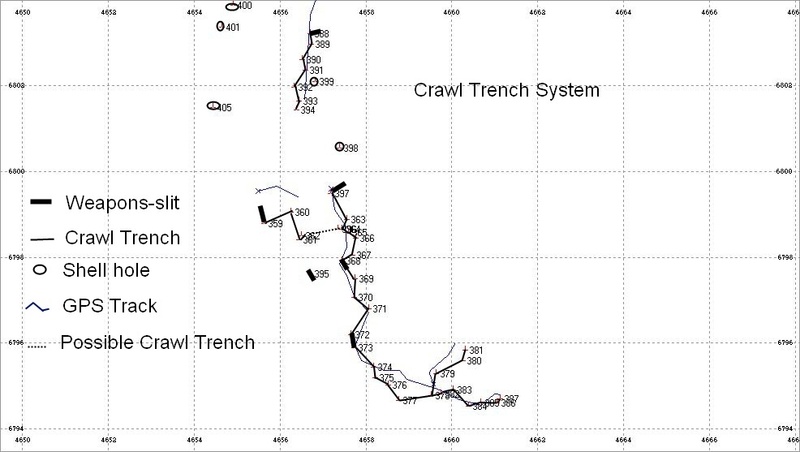 Image 2: Map of the crawl trench system recorded on Monday - both 'joining the dots' with way points and using a track are shown. Image 7: 303 bullet embedded in wood - find quite a few of these!! A quick visit after work yesterday to record some more ant-tank cubes. These have actually been visible for over six months now, I first noticed them sometime last year after a storm but have only just now got round to recording them. Another small fragment of the once formidable WW2 defences in this area. 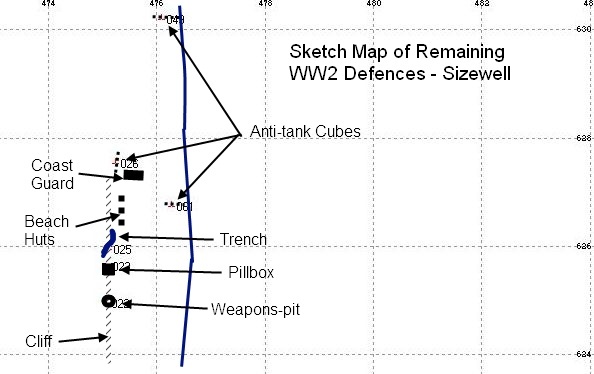 Image 1: Sketch map of remains of WW2 Defences, Sizewell Power Station area. Image 2: The 'new' anti-tank cubes exposed by storms last year. Image 3: 'Suffolk Square' pillbox, Sizewell Cliffs. Image 4: Turnbull mount - note the rough fit - the pre cast embrasure has been chiseled away to incorporate the mount. Image 5: What appears to be the remains of a short section of fire trench on the cliff top. 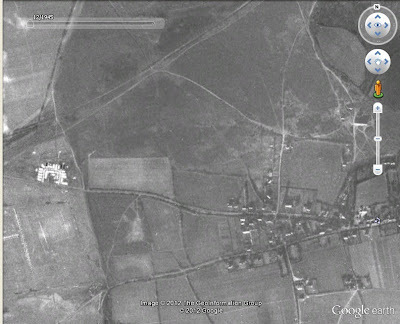 Work still continues in trying to build up a picture of the remains of this Second War training area. Today met up with David Sims to have a probe around one of the destroyed concrete structures (after of course getting permission). I have already blogged on these structures - part of a 'replica' battlefield in order to train infantry in attacking German 'Hedgehogs'. The purpose of the investigation this morning was to determine if these structures could ever have been manned during training or were they entirely just to replicate German fortifications? 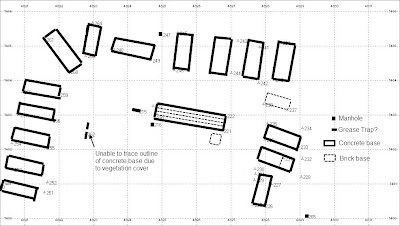 A dig in the interior of the best preserved structure revealed it's concrete floor. The distance from the floor to the roof interior was only 45". This would indicate that these structures were never intended to be manned. So the conclusion from today's work is a strong indication that Exercise Kruschen training was either entirely demonstration or "one-sided exercises". "One sided exercises", as the name suggests, involved only one side represented by troops (in this case would have been the attacking side). The enemy would be represented by the "director" of the exercise and such exercises were useful in training troops as the "director" could predetermine certain situations. Image 1 and 2: The best preserved concrete structure at Westleton Walks. Image 3: The exposed concrete floor (or raft on which the structure was constructed on). Another small step forward in matching field work to surviving documentary evidence! Been away on sabbatical to Syria for the last four weeks so no work on the blog or websites recently! This post relates to mapping the surviving camp area for this battery which I carried out in Jan but have not yet got round to posting. This battery was a HAA battery i.e. equipped with 4 X 3.7" Mk II C guns, AA No 3 Mk V radar and AA No 10 Predictor. The deployment of batteries to the Diver strip was a hurried affair and at first there was some difficulty in providing sufficient materials to construct the command posts, camp structures, generator and ammunition shelters etc. One AA Brigade diary notes that a target date of Dec 15th 1944 was set to complete winter quarters (Phase I) for the battery crews. It notes that approx 20 tradesmen from AA Command Construction and 80 unskilled men from light AA Regt's/Search Light Regt's were provided to construct each camp. This phase was completed by Dec 1944 although huts still needed wooden floors and interior decoration. In many cases the battery crew completed this work themselves in the hours of darkness. Phase II, the provision of offices, stores, motor transport repair bays, guard rooms etc was set for completion by 15 Jan 1945. Electricity was to be provided by 30 KVA generators. In most cases water for camps could not be provided by water mains and had to be brought to site by cart. Central bath houses were under construction which would serve a number of battery sites. Although T13 was not part of the AA Brigade from which the above comments of "Winterisation" of camps relate to, circumstances would undoubtedly have been the same for all Diver batteries in Suffolk. 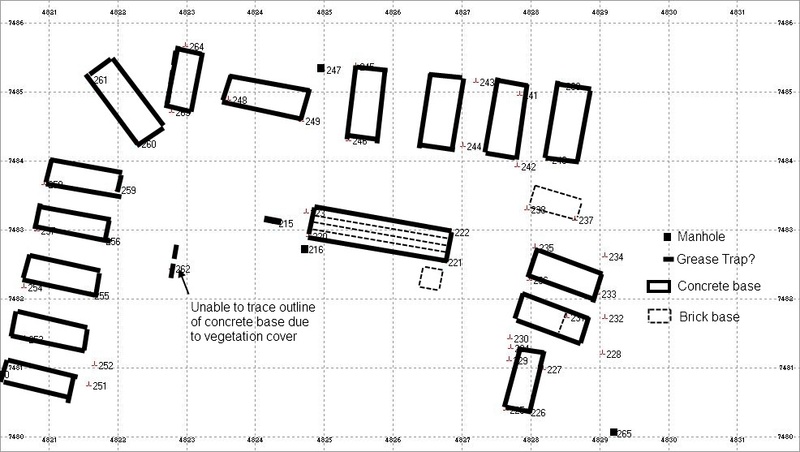 The plan below shows the remaining concrete bases on which the nuts would have been constructed on for T13's camp. Also remaining are some soak pits and a grease trap. Nearby are four large gun pits in line, which at first I thought would be for the four 3.7" guns. However I now believe this was not the case but this is for another post! Image 2: Aerial photo of battery T13, 1945. Image 3: One of the remaining concrete bases on which a hut would have been erected on. Image 5: That strange 'fencing again' - which I have posted about on previous posts on Diver batteries - note the steel rope also visible in this photo. Image 6: View of the camp area (situated in the scrub behind the telegraph pole). Image 7: 2" mortar round for an illumination flare found in the area.